UPDATE: In an effort to appeal to the teams that might be in the fence on participating or not based on the idea of riding 80+ miles, I'm suggesting that you sign up anyway. You are welcome to ride 40, 60, or even a 100 miles if you want before you finish. We're giving you a turn-by-turn route that is 83 miles, asking you to hit 3 checkpoints, and ride at least 80 of those miles in order to be crowned winner. Not really interested in winning? Then ride whatever distance you want to ride as long as you know how to get back to the start/finish line. I've been using Garmin Connect to plan the route for the Great 80, which is extremely convenient to do. Today, I took off in the truck and drove most of the route in order to make sure the route was going to work. There was a large portion of the route that I've not ridden before and I also wanted to make sure I didn't have too much gravel or put a lot of riders on roads that had a lot of traffic. The route is going to be beautiful on October 5th as long as the leaves continue to change by then. 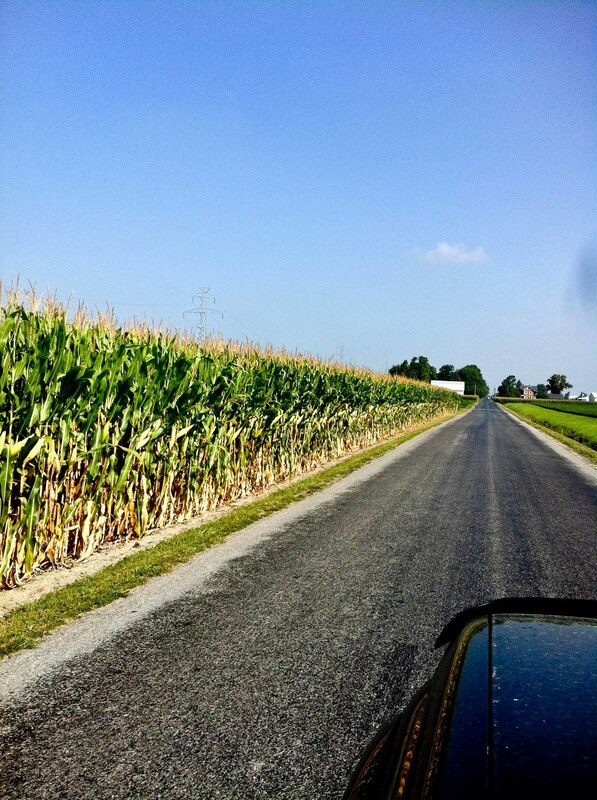 There is a good mixture of nicely paved roads, old country roads, a little bit of gravel here and there, and plenty of midwestern scenery that makes NE Indiana great. Most of the roads will be familiar to at least one person on your team unless you're coming from out of town. Portions, but not all, of the route are normal sections of 3RVS routes and other event routes. For everyone worried about the gravel sections, please don't worry that much. There are only going to be a few sections and they are not very long at all. I'm actually going to cut a few sections out after driving the route. So, you may only have a mile or two max of gravel out of 80, which won't be that bad. You shouldn't let it persuade you from participating. The beauty of this event is that if you want to bypass those sections and you know where you're going or have an iPhone with a GPS, you can go around them. You might ride more miles but it's up to you. "Great" in Great 80 is supposed to bring some elements of suspense, uniqueness, and overall feelings like there might be something bigger to this event than your typical group ride. One of those elements is going to be the route, and the fact that you won't know what the route will be until the day of the race. I've given you a little glimpse of it in the pictures below for those that are on the fence because of that little fact, but you won't be able to tell exactly what all the roads will be by that images. Plus a few roads may change slightly. You can trust that we will do all we can to keep you as safe as any other ride you've done on your own or with your buddies in the past few weeks on your own. You can also trust that we want you to get from the start line to the finish line with the least amount of confusion as we can. As always, send me any questions you have by hitting the Contact Us link and submit a question. Happy to answer any and all questions.